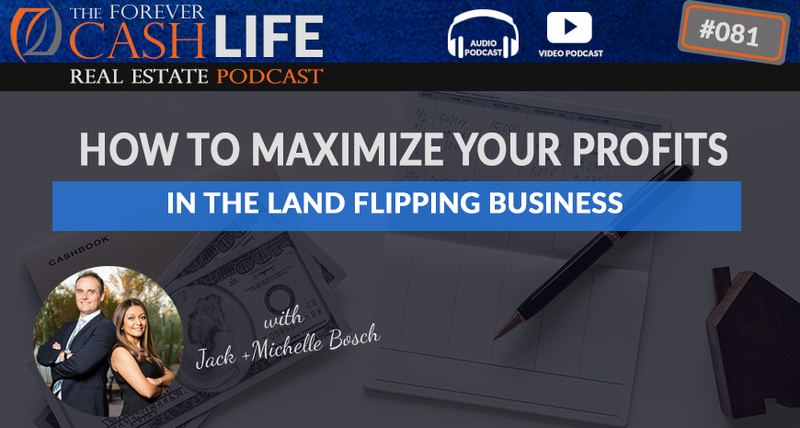 Jack Bosch discusses some tips and tricks for getting as much money as possible out of your land flipping deals. In this episode, Jack will break down his strategies relating to costs involved in setting up the deal as well as some interesting ways to restructure your deal for maximum profit! You’ll learn about all the ways that service providers charge you for doing things that you could easily learn yourself, as well as how to think about your deals in innovative ways. Jack: Hey there, and welcome to another episode of the “Forever Cash Real Estate” podcast. I’m coming to you today from the media room and bar room of our new house. We’re super excited. We just moved about a month and a half or so ago and absolutely are loving it. There’s lots of space, video rooms, and things like that. But today we’re going to talk about how you can actually maximize your profits. How do you increase your profits per deal but also per year? All right, so let’s get going with that in just a second. Man: Welcome to the “Forever Cash Life Real Estate Investing” Podcast, with your hosts Jack and Michelle Bosch. Together, let’s uncover the secret to building true wealth through real estate, and living a purpose-driven life. Jack: Okay, so here we are back. Right now I’m excited to share with you a couple of techniques on how you can actually maximize your profits in your land flipping business or real estate flipping business. So first of all, you’re going to look at what is your cost that is involved in the deals, then we’re going to look at how you can actually make more money on the same deal by structuring it differently. And then perhaps we’re going to come up with some more advanced techniques or not advanced but it’s more creative ideas on how you can also make more money here. So, first of all, let’s look at the cost. So as you know as I teach in my land profit generator program and you can find the link for that below here, we teach land flipping and we’re going to talk about land flipping a little bit but can you also do that in the house flipping area? So when you buy a house so for example, when we bought this house the closing cost of the title company was something like almost $7,000. Well, I probably at the price point of the house. I’m fine with using that title company and so on. But if I would have bought… When you buy a piece of land that you buy only $500 for but it’s worth $10,000 or right now Sue and Gretchen, they just bought a property for $1,000 and sold it for $18,700. Well, if you buy a property for $1,000 and you go to a title company, then you end up paying another $1,000 or $1,500 for the closing costs. And you can avoid that by doing the closing yourself. So we have a module in the land profit generator that talks about that. But just quickly, doing a closing yourself can save you a lot of money. Now you do not get title insurance with it. But title insurance doesn’t cover that much anyway. So title companies give you title insurance. First of all, here’s the thing. You pay a title company for the effort of doing a title search, then you pay them for the effort of closing the transaction which is probably the most valued part of the entire piece that you should pay for and then you pay him for an insurance which covers you in case the title company made a mistake in the title search that you paid for in the first place. That’s kind of what it is here. That’s kind of what it is. And so I think to me that sounds a little bit strange. Because at the end of the day, why would you want to pay for something to protect you from something that you paid somebody else to do in the first place? They almost kind of like should pay you. But anyway, I’m going down a rabbit hole here. So you can learn how to do a title search. So doing a title search is not that hard. It’s not that difficult. And literally, it comes down to you researching there what’s called the chain of title. You go, “Who is the current owner? Who did you buy it from? Is there anything happened in between like a mortgage and was it paid off?” Things like that. “Was it all clean? Who did that person buy it from and is there something happening between? Was there a mortgage? Was there a tax lien? Was it all paid off?” And so on. And as you go through and you find that everything was paid up, all you need is a deed and the deed you can write up yourself, which I believe is legal in every state, but you might want to check with your attorney at least in Arizona where we do this and other states, you as the principal in the transaction can draft your own deed. So therefore, you can save up to $1,000 or $1,500 in the process, because the title search can be done mostly for free online or you can hire an abstractor for about $50 to $100 and the abstractor does the title search for you. And then you still issue the deed and send the seller the deed to sign and now you own the property. So there’s a way that you can save $1,000 per transaction. You do 100 transactions per year, you just saved yourself $100,000. And it’s not that much work once you know how to do it because you literally can often do a title search in about 30 to 45 minutes, using the online county recorder’s website. So that’s a way number one that you can make by 100 deals a year make an extra 100 grand in your business. Now the selling side, it’s the same thing. When we sell the properties, we can use it in our company but then there’s another $1,000 or $1,500 cost involved. Well, you can avoid that because if you already did the title search up front and you bought it yourself or even if you used the title company or particularly when you used the title company, you can ask the title company to give you something like that’s called a Hold Open title policy. When you have a Hold Open title policy, they will allow you to pass the title policy to your buyer without having to pay the full amount of title insurance costs again. So it’s a cheaper way to close the second part of the transaction, the sale of the transaction. You pay full price here actually even a 10% more but then you paid much, much less over here. So when you do that on top of it what you want to ask your buyer is at least a $500 closing fee and often the $500 closing fee that you ask your buyer to pay will actually pay for the transfer and for the escrow portion of the title company transferring ownership to them. The title company then draws up a new deed, issues the new deed, endorses the title company over from you to the new buyer, and they do that probably for about $500, which is what you charge the buyer for. So now if you do it as such, you pay the title insurance up front but you don’t pay it at the backend. Or you don’t pay one up front and do it yourself. And then when you sell it, particularly if you do seller financing, if you sell with seller financing, in that case you go and you are still asking for the $500 closing fee, but then you just have them sign the sale documents, the note with the land contract if you use a land contract, which is a buying and selling agreement and the note all in one document. So if you have them sign that, you get the $500 and nobody else gets paid. So therefore you didn’t pay a cost at the buying and you made $500 when you’re selling in just closing costs, you just added, you avoided the $1,000 to $1,500 dollar cost here, you avoided the $500 to $1,500 cost here and you actually got paid. If you really add that up together, the difference is instead of paying $1,500 dollars and another $500, which is $1,500 to $2,000, you actually get to pay nothing or perhaps $100 in like FedEx costs, and made $500. So the difference is between $1,500 and $1,900 dollars net between what you pay and what you make. So right there you do 100 deals a year doing that scenario, and you just made yourself another $200,000, $150,000 to $200,000 in your business. But now let’s talk about making the real money here. And the real money is really made when you structure the deal differently. When you structure your deal differently, you can make a ton more money. And again, we’re talking about particularly our landslips. Because when we [inaudible 00:08:06], I’m sure it works for houses too. Usually though when you do houses, you don’t get to have the same margins that we have on our land flipping business. So it’s very common. Like we sold, two weeks ago we sold a piece of land and enfilade in Phoenix, Arizona that we bought for $5,000 and we sold it for $64,000 with seller financing. So let’s run through the numbers. This property was worth about $70,000. So we pretty much got almost full market value for it. We got like 90% of market value for that property. So that’s exciting in the first place. But what would have been our alternatives? Well, there’s two alternatives here or three alternatives. Alternatives one is you can put it on the market for $70,000 and sell it cash. In any market right now, this going to take a little bit to happen, so your property might sit on the market for half a year before it sells like that. The second option is actually…so let’s discard that option. Let’s really talk about our two favorite options which is one wholesale, number two, seller financing or also called seller carry back. So now in wholesaling under normal circumstances what we would have done on this deal, we bought it for $5,000, we could have easily listed it for quick cash sale of $35,000. Somebody would have come along probably within a week or two, would’ve bought the property, would have given us $35,000 and we would have made a net profit of $30,000. If we use a title company, perhaps minus another $1,000, so $29,000 in profit. Let’s round it up to 30 grand for easier conversation. We’ve made 30 grand on that deal. Is that something to scoff at? No. Absolutely not. That’s more than most house flippers do. And we did it all remotely. I haven’t seen that property probably ever. I think I drove by not too long ago about once but I kind of liked from the interstate I saw it. I was like there’s my property and I drove by. Because it’s land I don’t have to go and look at it. So the second thing now, so would’ve been making $30,000 profit. Now based on a $5,000 investment, that’s a 600% return on your investment. I know it sounds crazy, but that’s just happens, right? That deal, we just sold that deal and we actually…here’s the thing, we didn’t make a 600% return. We are going to make a I think over 2,000% return on that investment. I know, crazy. Stay with me right now and I’m going to share with you how that works. So instead of seller selling for cash, when you sell a property with seller financing, what’s happening is that you now get to increase the price because the deal is no longer in the price, the deal is now in the actual low down payment and low monthly payment. On the wholesaling deal, the deal was in the low price. A $70,000 property for $35,000, it’s a no-brainer. Let me find the money somewhere under the bed, in the bank account, they let me sell some stuff to get the money. That’s what our buyers think. They go to grandma, they’re like, “Give me the money. I found the deal of the century.” And they’re going to find the money and pay you cash. With seller financing, you’re now going after people who don’t necessarily have all the money in the world, but they do have the ability to put down a down payment and then have a monthly payment. Because if you’re looking at, you pull out the financial calculator. By the way, you can get financial calculators from online. I use one that is called…I need to pull up my glasses for that here. But this thing is called Mark Money. M-A-R-K Money. Mark Money, there we go. It is a great tool because it is a car loan calculator, a home loan calculator, a loan calculator, a mortgage calculator, a savings plan, withdrawal plan, compound interest, and even an inflation calculator. I really like that thing, Mark Money, and it’s great. So we put the numbers in and even if we charge, let’s say if we charge a 10% interest rate on a…so it would’ve been $64,000 minus $3,500 plus a $500 closing fee. Remember we still had that, they will have given us $4,000 and/or something like that, and they were the still owed us $60,500. So he did that. He paid us an extra $3,000 for a total of $6,500 down plus the $500 closing fee. So he paid us $6,500 down so now he owes us $57,000 or 57,000 and a half is what he owes us, and we were able to reduce the interest rate to I believe, I don’t have the numbers in front of me, but I believe somewhere around 8%. And with that he now only his interest on that is only around $4,800 or $5,000 a year and he was able to pay a little more $510 a month. And with that, now it became a 20-year loan. But now let’s run the numbers. If we get over 20 years, we get an average of about principal and interest, in this case, it’s about $470 or so, $460. If we do $460 times 12, that is $5,520. That’s what we’re receiving from them that we get to keep times 240 months is actually times 12 years. What was that? $470 times 12 times 20 is we’re going to receive $112,800 from this person over the next 20 years. Now let’s us divide that this is based on a $5,000 investment which, by the way, we got back right away. So if we add to that the $6,500 that we got plus the $500 that we got, it adds up to $19,800. And that divided by the $5,000, it’s basically that we paid for it, we are getting 23 times our money or actually almost 24 times our money on that deal. In other words, we’re getting our return on investment is almost 2,400%. Remember on the wholesale side of things, we will have made a 600% return on the seller financing side, we’re going to make a 2,300% approximately on our investment. Isn’t that crazy? I know it’s absolutely crazy. Now given one comes in right away, the other one comes in over 20 years, but it is still an absolutely amazing return you can make. So therefore, if you look at that, how do you increase your overall returns? You go from cash wholesale deals to seller financing deals. So now let’s look at the third way that you can do this. What if with these deal right now, we sold this property for $64,000? The guy paid us $6,500 down. $64,000 minus $6,500 is $57,500. That is what we have in finance. And here’s the thing. He only gonna, in the first few years, his principal portion is only going to be like perhaps $1,000 a year, if not less than that. So if we age this after one year, he still owes us $56,500. Could we go and sell that note within a year to somebody for let’s say a 25% discount for $42,000 for the $2,275? Yes, absolutely. So how much did we receive then if we do that within one year? Well, we received the $6,500 down, we received one year worth of $470 principal and interest. So that’s $5,700. We received all that money, so we received $42,000 plus $5,700 plus the $6,500 is we received $54,000. So if you compare that, we sold the property quickly, we received cash flow, our cash back at closing plus an extra $1,500 just for fun of it plus we received $5,700 over the first year in just monthly payments plus then receive $42,000. So within one year, we received $54,000 of that deal of which $5,000 is the original loan we paid. So we made a profit of $49,000 on that deal. So you look at it, a wholesale deal, $30,000 profit, seller financing deal, $112,000 or $120,000 profit or $115,000 profit after everything is said and down. A seller financing deal and selling the note within one year, right away our money back, right away cash flow, and a $42,000 backend, which is better than the wholesale deal. So there is three different ways. Most people think wholesale, wholesale, wholesale, wholesale. But there’s two other ways that I wanted to talk to you about today that I wanted to share with you that you can make more profits in your business by structuring the deal different and having different exit strategies on your deal. Is that cool? I hope that makes sense. I hope that brings the wheels to turn a little bit. If it was too complicated, rewind, watch it again or put a comment below, our team and myself, we’re monitoring this comment. So if you have a question about how that works, if you’re watching this on YouTube, of course right now, if you’re watching this on YouTube, if you’re listening to this on iTunes, go over to YouTube to subscribe to our channel. I think it’s the Jack Bosch or Jack Bosch Project Lead generator channel, subscribe to it, watch the video there, see the bar in the background, hangout and see our house and then enjoy that episode. And then you can fast forward and listen to things again, ask questions below. But if you’re watching this on YouTube, go on iTunes and go subscribe to it or whichever other platform. We’re passing it on also to the to the platforms that are not iTunes so you can watch it on Android or listen to it on Android too. All right. So last quick way that you can increase your profits. We talked about saving costs on the purchasing side. We talked about asking for fees on the selling side and also saving costs by doing the Hold Open policy. We talked about structuring deals. Here’s another way that you can do. What if you have a real estate license? Not everyone does and you don’t need a license to do this because you’re acting as a principal. But what if you are doing a deal where you can literally work on…what if you have a license and you come across in our technique or in any kind of technique, you come across a ton of people that sometimes don’t actually want to take our price. If you’re offering 5 to 25 cents on our land deals, not everyone is going to take that. So what if you could align yourself with a realtor that you could pass those deals on? Now many states have rules that if you’re not a real estate agent and you pass a deal on to the realtor, the realtors are not allowed to pay an unlicensed person a referral fee. But if you are a realtor then you can absolutely add to that. You can refer to deals that they don’t accept your offer over to a realtor. They call them up, they say like, “I heard you’re interested in selling your land, would you be interested in me listing it for you?” And 1 out of 10 will perhaps yes and your buddy gets to pick up some listings. And if you have a license, you get a referral fee, which is usually one third of his commission. And we do that I have a license in the state of Arizona I don’t use it. I even hired another realtor to sell my own house or our old house. It’s on the market right now. But you know what? Because I have a license I get a referral fee from him for selling my own house. So I make a third of the commission or in other words, I save a third of a commission because I have a real estate license. And if we come across deals that the seller we just can’t come to terms, we can pass it on to the other person. All right. So with that, that concludes our podcast, our video and audio podcast here. Again if you’re an iTunes, make sure you go there you submit a five-star review and actually write a text to it. That helps us get ranked on iTunes, help us spread the word, change more people’s lives. And if you’re on YouTube, then put the thumbs up, leave a comment below, engage, watch the other ones, subscribe to our channel, and we’re looking forward to seeing you in the next episode. Bye-bye. Man: Enjoy this episode, then make sure you like, subscribe, and post your comments and questions below the video. We’re looking forward to hearing from you.